I am an optimist. I'm no conspiracist. I just happen to think the road to hell is paved with good intentions. As a result, I own gold. Let me expand. Too much debt in the world? Try to outgrow its debt load: as the economy grows, the debt-to-GDP ratio declines, possibly making the debt burden more sustainable. Pay off the debt by raising taxes or lowering expenditures to lower a country’s debt-to-GDP ratio. Restructure, i.e. defaulting on the debt. “Print money” – or more precisely the modern electronic version thereof, as can be achieved through asset purchases by a central bank. The Eurozone has been experimenting with austerity in an effort to contain or lower their debt-to-GDP ratios over time. In contrast, the U.S., U.K., and Japan have shown a willingness to resort to the printing presses to address their debt loads. In our assessment, the Eurozone has shown that policy makers will only make the tough choices when forced to do so by market pressures, notably the pressure of the bond market. Unbeknownst to many, the European Central Bank (ECB) has actually seen its balance sheet contract of late, as banks have returned unwanted liquidity. Similarly, a key reason the Eurozone crisis erupted was because the ECB never “printed” as much money as other major central banks. In this environment, select banks and governments might restructure their debt. The fact that some of the decision-making processes may be broken is, in my view, not sufficient reason to flee to gold: keep in mind that decision making processes in many other parts of the world may also be considered fairly dysfunctional, although with different flavors. Importantly, the Eurozone’s current account is reasonably balanced; money was sucked out of weaker Eurozone countries, the “periphery” all right, but the perceived safe havens were the stronger “core” countries. As such, the Euro has been most resilient, even as the periphery has suffered. Also note that since last August, money has been flowing back from the core into the periphery. Predictable, because rising interest expenses, as well as entitlements (social security and Medicare obligations being the main drivers) may crowd out all discretionary spending, and then some. The crisis is avoidable, as comparatively minor changes to entitlements, might make the programs sustainable. However, while I have the highest respect for Mr. Bowles’ efforts, in my assessment, political gridlock is going to prevent entitlement reform from becoming reality. To make matters worse, tax revenue has been coming in above expectations of late, reducing potentially any sense of urgency that might have been in the public’s perception about the challenges. Having said that, as I indicated in the introduction, I’m an optimist. There is a path forward. Except that such a path forward requires the pressure of the bond market, as the only effective tool I am aware of to get policy makers to make the necessary tough decisions. But if I am correct, what are the implications of bond pressure being applied? Unlike the Eurozone, the U.S. has a significant current account deficit: we are dependent on foreigners financing our deficit. If bonds fall out of favor, i.e. if it is the bond market that has to give policy makers the right “incentive” to act, the fallout for the greenback might be far more severe than it has ever been for the euro. But what about the shale gas boom? Don’t we reach energy independency, changing the dynamics, fixing our current account balance? I agree that the domestic energy boom is a positive force, but it is my assessment that even should we reach energy independence (by the way, our neighbors up North have long learned that energy independence does not mean low gas prices at the pump), it won’t entirely wipe out our current account deficit. In our analysis, the math does not add up for interest expenses and entitlements. Keep in mind, though, that the math is only a factor: it’s perception that really matters. Spain, for example, had rather prudent debt management, but fell out of favor with investors as public confidence eroded that policy makers would engage in the painful, but necessary structural reforms (structural reform, by the way, tends to refer to political minefields such as opening up labor markets, removing laws that discriminate against youth by protecting elderly workers). But, wait, don’t we have the Fed that can ensure we can always pay our bills. As our central bankers have told us, “we have the printing press!” Yes and no. As history has shown us, there’s a limit to the power of the printing press. Relevant to the discussion at hand, gold has been shown to preserve wealth better than the currencies of central banks ramping up their printing presses. So while we might be able to nominally pay off our obligations for some time even in the absence of entitlement reform, there is a risk that the Fed will continue to “monetize the debt.” When a central bank finances a country’s government deficit, that the valve is often the currency. In the context of what might happen to the greenback, I own gold. In our assessment, Japan, with its debt-to-GDP ratio substantially above 200% has a problem. The biggest problem may well be complacency: Japan’s populist Prime Minster Abe wants to pursue Depression era fiscal policy, as well as aggressive monetary policy to help Japan out of deflation. What policy makers in Japan appear to underestimate is that the country’s current account surplus has melted away. In the past, the more dysfunctional the government was (7 prime ministers in 7 years qualifies as dysfunctional in our book), the less money the government was able to spend, the less pressure it was able to exert on the Bank of Japan (BoJ). As long as the country had a current account surplus, inaction allowed market forces to play out, encouraged consumers to save more, a positive feedback loop fostering deflation, as well as a stronger yen. As Japan’s current account balance has been eroding, the dynamics have been changing. Most notably, the yen is no longer the safe haven it used to be. While the yen was the best performing currency in 2008, beating the U.S. dollar by a wide margin, market participants appear less and less eager to flee towards the yen whenever a new crisis has flared up since. Unlike the U.S., Japan does not have political gridlock. Quite the contrary, Japan’s government commands a two thirds majority in the Lower House and is likely to also gain control of the Upper House. Japanese policy makers appear to be convinced that they can beat deflation. We agree. But we think they will get much more than they are bargaining for, as I do not see how the yen can survive the fallout. We see the volatility in Japan’s 10-year bond (JGBs) as a clear warning sign of things to come. Japan’s JGB market, while large, is not as liquid as the US Treasury market. For now, the BOJ has said they will not intervene to put a ceiling on JGB yields (while yields have spiked and been volatile, they remain at or below levels from about a year ago). But we believe there’s a good chance that these yields will move above the comfort zone of the BoJ at some point. While shorting the yen has been a popular, if not crowded trade, the long-term dynamics suggest to us that, ultimately, the yen will act as a valve. We don’t know whether the yen will be destroyed in this process. But to us, there’s a risk that negative side effects play out. The bad news here is that Japan is no Cyprus, but a much larger economy. In the context of what might happen in Japan, I own gold. The UK has another set of challenges. For starters, the UK has suffered from stagflation for some time. Second, Mark Carney’s tenure as the head of the Bank of England (BoE) is about to start. The former head of the Bank of Canada has indicated he might pursue nominal GDP targeting, or raise the BoE’s inflation target. Recent market turmoil might have him hold off with radical moves (the first BoE meeting he chairs will be on July 4th when U.S. markets are closed for Independence Day). But as Britain’s problems won’t go away, we recommend keeping an eye on the UK. 2008 also showed another vulnerability in the UK: because British banks are rather international, they might have a currency mismatch between their assets and liabilities, making them more vulnerable in a currency crisis. Imagine, for example, that a bank gets its funding through domestic deposits, but extends loans abroad. A plunging currency might render a bank insolvent. This isn’t a near term problem, but as 2008 has shown, one should not ignore possible tail risks (Black Swans). In the context of what might happen in the U.K., I own gold. What will trigger a resurgence of gold? These arguments may be convincing to me, but most don’t like to lose money in the interim. When is the right time to buy gold, should one agree with the scenarios outlined above? To me, it’s not even about whether I will be right. It’s about the risk of being right. As I believe there’s a risk that some of these scenarios unfold, I own gold. Market timing is very difficult, especially when it pertains to the future. This overused phrase should be taken seriously, though. The credit bubble started to burst in late 2007 not because of the blowup of a financial institution, but simply because an appreciation of risk crept back into the markets. On the backdrop of low volatility, consumers and banks alike employed leverage. Consumers by using their homes as a piggy bank; banks by finding ever-new ways to gear themselves up. It was the rational reaction to a low risk world. As risk came back on the minds of investors, it was prudent to pare down leverage. The problem was that when “everyone” deleverages simultaneously, prices tend to plunge rather rapidly, and those not holding liquid collateral may face first a liquidity, then a solvency problem. In short, we believe the best bubble indicator out there might be any one asset or asset class that exhibits volatility below its historic norm. Complacency attracts the wrong type of investors. Think tech stocks in the 90s; think housing the last decade; or think Treasuries. The Treasury market, historically speaking, is a rather volatile place. We don’t need the Chinese to sell their Treasuries for there to be a potentially rude awakening in the bond market. A lot of money in the Treasury market is not used to the sort of volatility that, in our assessment, may be the norm rather than the exception. But what can get the Treasury market derailed? The recent volatility is foremost due to the “taper talk,” the Fed’s announcement to eventually phase out Treasury purchases. What we see unfolding now may well be the best case scenario. What I mean by that is that policy makers try to do the right thing, to mop up liquidity, but then policy makers have to back off as the market is unable to sustain the higher borrowing cost. This environment wrecks a lot of investors’ nerves, but has not shown to be a positive driver for the price of gold. 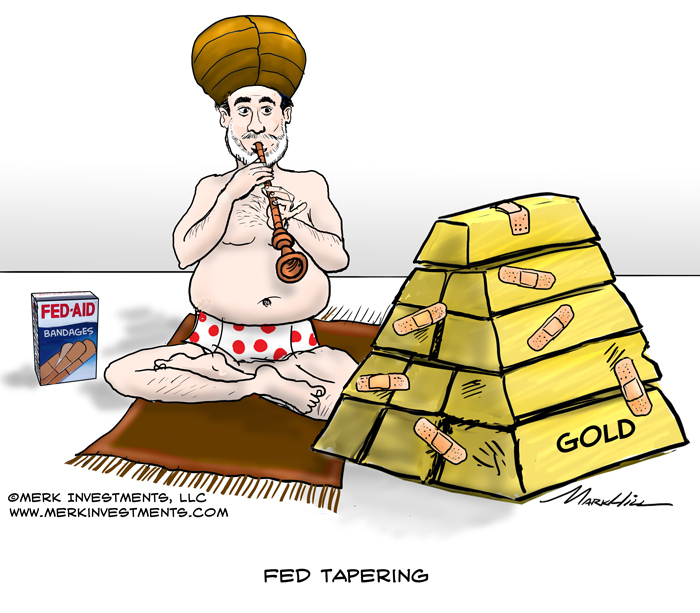 If and when the backing off on the tapering idea comes, then gold may well benefit. If not handled well, confidence in the Fed may well erode. The bigger threat we see is economic growth itself. Let some of these policies work. Good luck to contain Treasuries then. Inflation could also cause havoc in the Treasury markets. However, we interpret the market as a whole to be more sensitive to economic growth right now than to inflation; indeed, inflation metrics we are watching have been declining so much that we are surprised the Fed is talking about “tapering” rather than expanding quantitative easing (QE). The current taper discussion may advance to a new stage once we know who will succeed Fed Chair Bernanke, whose term is ending in January. If Vice Chair Janet Yellen is to succeed him, as we expect, the Fed would be lead by a person with a reputation of making Bernanke look like a hawk. How long will I hold my gold? There’s always a chance I will change my mind with regard to any investment, so please make sure you understand I state this in the context of what I know as of this writing. Having said that, some the dynamics discussed above could unfold in the near term; others only in years to come. As indicated, I care more about the risk of being right than actually being right. But looking ahead, let me add an additional observation: real wages in the developed world have stagnated for well over a decade, breeding discontent. Unhappy citizens vote for more populist leaders: in the U.S., politicians that can distill their political message into a tweet may have a better chance of being elected. While this may sound comical, it explains the rise of the Tea Party on the right, as well as the Occupy Wall Street movement on the left. My concern is that entitlement reform may be elusive for many years to come as we elect ever more polarizing leaders. In the Middle East, high food and energy prices on the backdrop of stagnant earnings have caused revolutions. Egyptians didn’t start a revolution because they love democracy, but because they want to feed themselves and their families. In Japan, the government is riding a populist wave. To me, these are all different faces of the same challenges. It’s only Germany where austerity wins a chancellor popularity. And even there, Angela Merkel has made lavish promises in the run-up to elections. The problem, of course, is that populism doesn’t resolve the challenges we face. Over time, political stability might erode. As such, we see a world that’s increasingly unstable in fiscal, monetary and political terms. Importantly, we don’t think investors should rely on their government to preserve their purchasing power. Indeed, a government in debt does not have its interests aligned with those of investors. As such, an investor interested in a gold backed currency should create their personal gold standard should they desire one. Be aware, however, that investors that have their daily expenses in U.S. dollar are likely to experience volatility in U.S. dollar terms with regard to their savings. As such, investors should consider throwing out the risk free component of their asset allocation model, as there may not be such a thing as a safe asset anymore. There you have it. These are some of the key reasons I own gold. There are more: please make sure you are subscribed to our newsletter to be informed when it becomes available. Also, please join us for a webinar that discusses gold or the currency asset class in more detail: click to join our webinar list ; our next Webinar is next Thursday, July 18.